Sound Impact is one of the 2018 resident ensembles for music in the schools at Music at Kohl Mansion. Inspired by the belief that the arts strengthen communities, Music at Kohl Mansion, now in its 35th season, presents world-class chamber concerts in the historic Kohl Mansion and music education in public schools on the San Francisco Peninsula. Aligned with Kohl for Kids’ theme “Everyone Has a Voice” Sound Impact’s newest education program inspires self-esteem for even the youngest audience member. This engaging new program explores themes of embracing our differences and staying true to oneself through the story "The Trouble With Ben" (music by composer D.J. Sparr, lyrics and story by Grammy award winning writer Barry Louis Polisar) and the timeless music from West Side Story (arranged by John Wineglass). 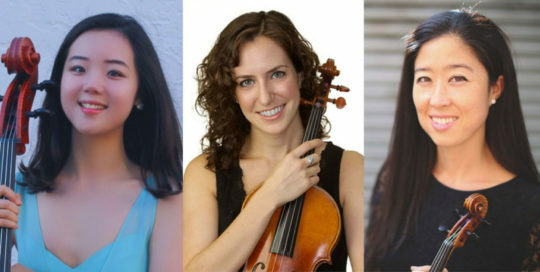 This program features interactive games to deepen the experience and understanding of these string instruments and new sounds and textures of contemporary music brought to life by a string trio.